So last week I made a slight error and posted the wrong training plan information. It was my previous Week 6 plan before I had adapted it. Based on how my training goes and how many runs I’m hitting (lately I’ve only been getting in 3/4 scheduled workouts), the Nike Run Club app gives me the option to have them adapt my plan every Sunday. The updated training went well. For the first time in seven weeks I actually completed everything that was scheduled, including a half-hour workout they provided me with through their sister app, Nike Training Club. I thought that the workout would be a breeze since I’m still doing other unscheduled strength and cross-training. Let me tell you, I was wrong. In half an hour Nike had me working up a sweat without using any equipment. This week I have two busy nights in a row so I’m a little worried about having time for all of my workouts but I’ll try my best. My main goal is to to finish the week feeling strong and accomplished – mainly a mental game. 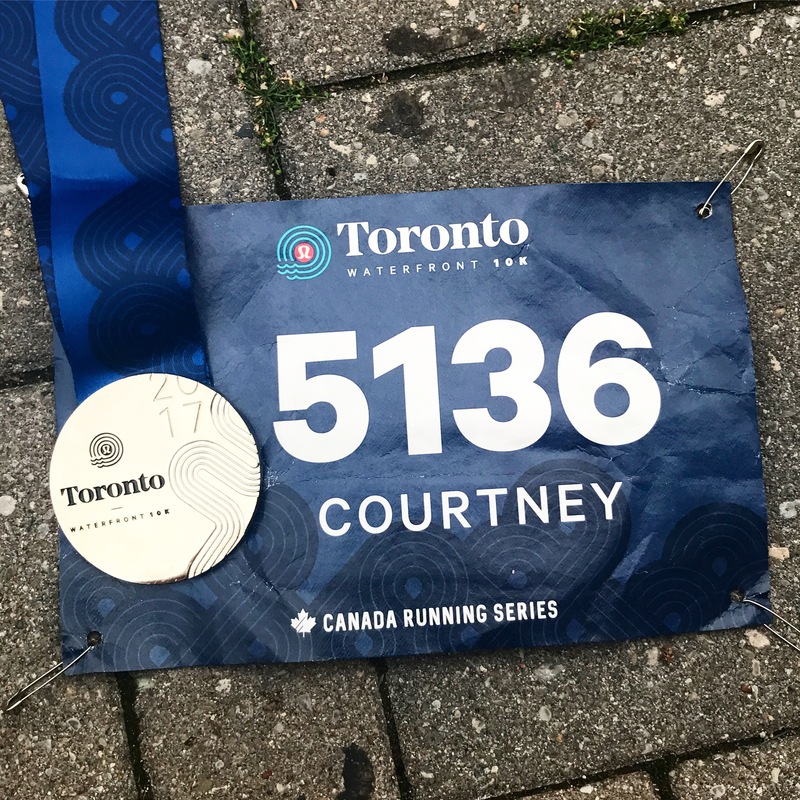 This past Saturday I ran the Toronto Waterfront 10K, part of the Canada Running Series, and I was surprised at how much I loved the race. I seldom have a bad race experience, but this one exceeded my expectations. It started with the race kit and kit pick-up. Sponsored by Lululemon, you could pick up your kit all week leading up to the race at the Queen St store in Toronto where you were eligible to get 25% off of your purchases. My mom was in Toronto that week so she picked up my kit, and grabbed a pair of my favourite running pants for me – the Pace Rival Crop. 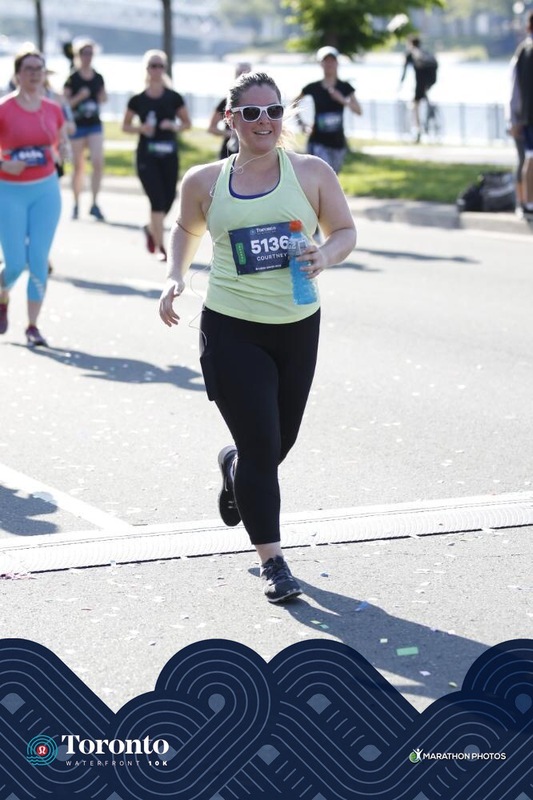 I was also excited to see that the race shirt was actually something I would wear again – Lululemon’s Swiftly Tech Short Sleeve Crew in black, with the race name screen printed onto the sleeve. Not only a great shirt – but I only wear a couple of my race shirts (funny enough, they’re all only from Canada Running Series events) because I’m picky about shirt design, so this passes the test. We drove in from Oshawa on race morning and parked the car at a lot just North of the start line. Suggested parking was at Nathan Phillips Square but there are so many lots in the area it really didn’t matter. We left around 6AM and made it before 7AM. This gave me time to use the bathroom before I got in line. I was in the Green corral, starting at 7:45AM. The first two kilometers were fast, but I lost service going under a tunnel so my Nike Run Club app kicked me ahead by half of a kilometer and screwed up my pacing and distance for the rest of the race. I tried to drink more on Thursday and Friday so I didn’t have to worry about hydration as much on Saturday morning, but I should have used the bathroom one more time because I ended up having to use a port-a-potty at the 3K mark. I never have to use the bathroom on course so I was disappointed to be losing out on time. I rejoined the race and the next two kilometers went smoothly. However, at 5K I decided I needed to walk. The morning was sunny, hot, and humid. As someone who always sweats I wasn’t surprised at how much I was sweating, but seeing the amount of sweaty people around me was a little shocking. I wasn’t feeling sick yet, but after a horrible experience on the previous Tuesday I decided to take a break before I became nauseated and weak. I picked it back up just before the 6K mark and ran another easy two kilometers until I hit a water station around 8K. I was running with a diluted mixture of water and Gatorade, but I needed a cup of plain, cool water. After downing that cup I felt relieved. I only had two kilometers to go, I was hydrated, I wasn’t feel sick… I was ready. I ran one more easy kilometer to the 9K marker, and then I picked it up for the last kilometer. My official finishing time was 1:17:59. It’s disappointing because I was hoping to get closer to the 70 minute mark, but between my bathroom and walking break I knew I was adding minutes to my time. The finishing chute was one of my favourite parts. 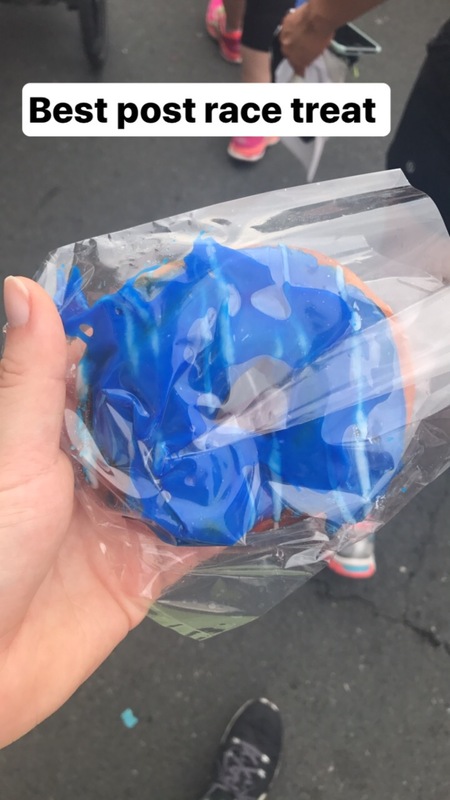 Not only was the finishing medal was one of the prettiest I have received, but there was also a wall of donuts, and individual damp towels to wipe up the sweat! I wish I had stayed around for the after party because I would have loved to attend the huge yoga session that was happening, but I didn’t want to hold up the people I was with. Maybe next year I’ll come alone. Overall I loved this race. The course was fun, the spectators were great, and the organized cheering sections were some of the best I have ever seen (they had a group of amazing people doing a cycling class, on stationary bikes, right beside the course!). I would definitely run this race again. The beginning of last week was hot and muggy. On Monday I was struggling to drink enough water and I forgot about the worst part of training through the summer – my body despises the heat. I get extremely nauseated in the warmer temperatures so I think I’m going to need to fit in as many morning runs as possible. This means becoming a morning person and I’m not sure I’m up to the challenge. On Tuesday I struggled so badly that I couldn’t eat my dinner after my run. In fact, the only thing I could stomach was two sugar-free Jello cups and half a liter of soda water. I also need to continue to find the balance between strength training and running, and get myself to the gym even when I really don’t want to go. Marathon training is not supposed to be easy. This week I’m a little nervous to be running such low mileage, but I trust in my plan, and it’s easy to see that with two tempo runs and strength workout (the Nike Training Club is part the plan that was built for me) that we’re working on speed and strength. A few weeks ago I started to try out a marathon training plan, and a couple of weeks later (when my confidence increased) I officially registered for the Scotiabank Toronto Waterfront Marathon.